Former Colorado Gov. John Hickenlooper said that he would consider putting a woman on his presidential ticket, and then asked why female Democratic presidential candidates are not being asked if they would select a man as their running mate. The comment struck a number of Democrats as off base, especially considering that the nation has never had a female vice president. “Of course,” Hickenlooper said, before saying he wanted to ask Bash a question. “How come we’re not asking more often the women, ‘Would you be willing to put a man on the ticket?’ ” he said with a shrug, to audible groans from the audience. 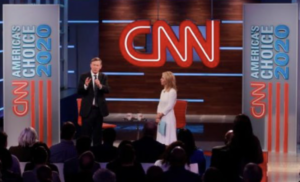 Hickenlooper stood by the comment after the town hall, telling CNN that his point was “too often media discounts the chance of a woman winning” by asking questions like that. What Hick was trying to do, in a nutshell, was to make the case that female candidates should be considered frontrunners on an equal plane with men and that asking a question about “would you put a woman on the ticket” is disrespectful to the women who are running for President. It’s a solid point that was inartfully articulated, and it would be a shame if it dogged Hick’s campaign for an extended period of time. Hickenlooper also had a weird moment when telling a story about watching an adult movie with his mother — this is a yarn that he’s spun before that is also included in his memoir “The Opposite of Woe.” The story is entertaining, but the problem with telling it to a wider audience is that there is no real “moral” in conclusion; it’s not clear why Hickenlooper is talking about this, and in a Presidential race where soundbites can take on a life of their own, this probably isn’t a great clip for Hick. Hickenlooper will certainly get better at this sort of thing the more he campaigns around the country, but “soundbite politics” are not his strong suit. This is partly because Hick just doesn’t have much experience in this regard; both of his campaigns for Governor featured massively-flawed opponents who didn’t have the ability to land solid punches. By the time Hick was running for re-election in 2014, the former Denver Mayor was a well-known character to voters along the Front Range who largely got the benefit of the doubt whenever he stumbled verbally. This is the same basic reason that Hick speaks out so often against “negative ads” — it’s easy to be critical of negative advertising when you have never had to worry about employing that strategy yourself. Hickenlooper is not any more or less likely to win the 2020 Democratic nomination based on Thursday’s Wednesday’s performance. In fact, if he learns and grows from this experience as a candidate, this CNN “town hall” might even prove to be a landmark moment for his campaign. 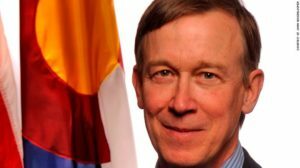 Hickenlooper introduces himself to America and America says, "Who?" Christ, what a donkey. If the term "Hickenblooper" isn't a thing just yet, it soon will be. I wish the weekend was here early, too. But, alas, it is only Thursday, and the town hall was last night. And file under: Colorado Democrats can do no wrong according to CPols. John "Drinkin Freakin Frackin Fluid" Hickenlooper. Say it three times fast and he'll be out of the race before you're done. Hickenlooper is looking like a fool at this point. I wish he had decided to wait and run for the senate. I have a feeling that he may ruin his chances of even winning a senate seat in Colorado by the time he leaves the presidential race. After a career of being an executive and running things, Hick has made it clear he has little interest in being in the legislature — even as a Senator. I've not read or heard him express disappointment about Bennet's appointment rather than him. Does anyone know how hard he was working to be named to fill Salazar's term? Goofy and idiosyncratic . . .
. . . doesn’t that almost always play better on a local or regional stage than on the national one? Frackenlooper appeared on CBS this morning. He did ok, but it bothers me that he never reveals his opposition to recreational pot. He sits quietly and lets people brag on him for stuff he has not done. He thumps his chest and brags about the methane rules never revealing that he and the oil companies were forced into it by the feds. He sure loves to accept credit he has not earned.